Water temperature is at an average of 25 Degrees Celsius and warmer, creating the most beautiful and comfortable snorkeling. Lady Musgrave Island while always amazing does have some extra special things that happen at Christmas time. The annual synchronized spawning of corals takes place after a full moon and only when the water has reached the ideal temperature. As Lady Musgrave Island is located at the southern tip and is classed as sub-tropical it does take a little longer to reach that ideal temperature of 26 Degrees Celsius, making December the perfect time to witness this phenomenon. The turtles have all paired up and mated and are now nesting and carefully laying their precious eggs. You will spot turtle tracks and see where the Green and Logger Head Turtles have been nesting during your Guided Nature Walk of Lady Musgrave Island. Say hi to our resident Turtle “Terrence” on the Glass Bottom Boat or maybe even get a closer encounter whilst snorkelling in the Lagoon. The birds of Lady Musgrave Island love to nest over Christmas. White Capped Noddy Turns can be found nesting in the Pisonia Trees, whereas the Silver Gulls, Bridles Turns and Black Naped Turns prefer to nest closer to the beach. With the Mutton Birds burrowing on the interior of the Island. 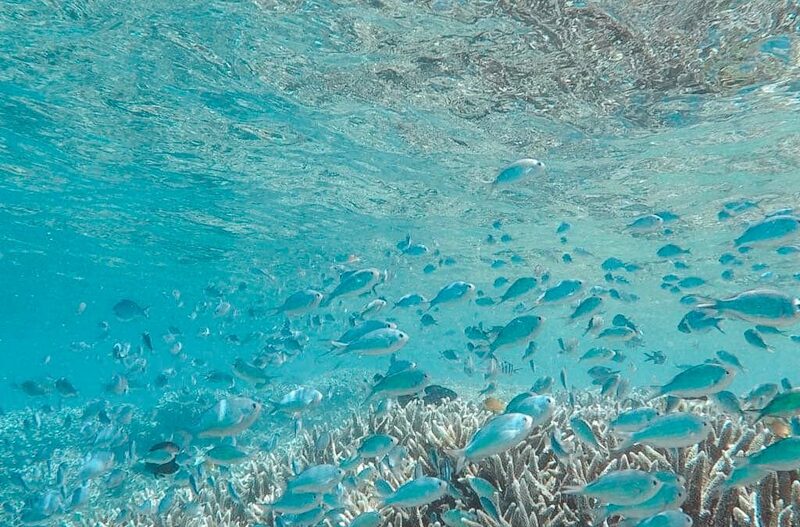 An underwater oasis is waiting to be discovered in the lagoon as you pop on your snorkel and mask to reveal on the Great Barrier Reef’s biggest swimming pools. Experience world class snorkelling where you can get up close to resident marine life; including hundreds of species of tropical fish (large and small), turtles and manta rays. See how many of the world famous Great Barrier Reef Great 8 you can spot! !